Canadian Rockies Backpacking and Hiking Guided Tours! Banff National Park on Horseback! Banff Whitewater Rafting... A Thrilling Adventure! Book a Ski Vacation! ... & Save Hundreds! Lake Louise Accommodations... Book Now & Save $500! Welcome to Lake Louise of Banff National Park! 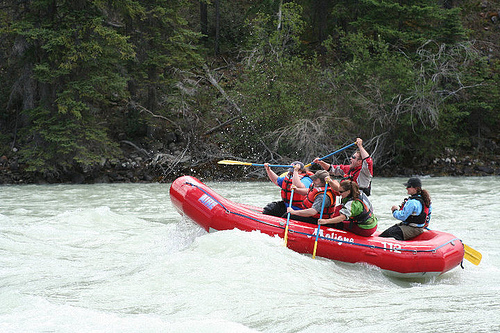 Have fun on a Kicking Horse River rafting trip that renowned as the best of Canadian Rockies and closest to Banff, Lake Louise, Golden and a pleasant drive from Calgary, Alberta. Why not take the whole family on a white water rafting banff trip? Several sections of the Kicking Horse River make it the perfect rafting trip for family rafting trips, first-time rafters, and those seeking the most exciting river trip offered in the Canadian Rockies. A quick word to big city dwellers - this is one of the 'last outposts of man in the area' - the next nearest 'destination' - 3 hours away - is Jasper, the next town out before you're enroute to Alaska - DO NOT expect to find a booming 'Aspen' or 'Vail' nightlife experience here. See what Jasper, Canmore and Banff are what visitors and locals love about he area! You will however find the best powder skiing on the Continent, unparalleled wildlife viewing opportunities, our famous Canadian Rockies scenery; and perhaps you'll find yourself again. The Village of Lake Louise is on the Trans-Canada Highway fifty-seven kilometers (thirty-five miles) west of banff. This quiet and small village offers a range of travel amenities, fabulous dining opportunities and accommodations. 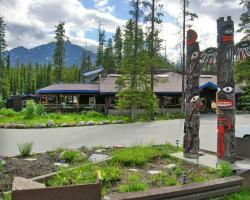 Nipika Mountain Resort - Canadian Rockies eco resort dream. 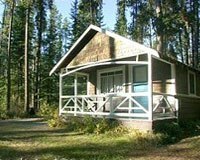 Johnston Canyon Resort - Banffs charming cabins. Your Banff vacation experience will come alive here. 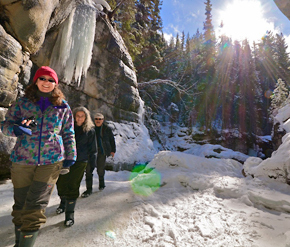 GyPSy Guide is the independent travelers dream to exploring the Canadian Rockies. Golden, a small town about 30 minutes further on, offers a broader diversity of businesses and services. This funky little town is on our up and coming list - while not for everyone; people interested in snowmobiling, and outdoor activities without the crowds are going to appreciate this valley... plus Canada's newest ski area (KickingHorse) has just opened here - the golfing and fishing is nothing to sneer at either. What to do if you don't ski or hike? We've organized things by month, but some activities could be done in multiple months or multiple seasons. Scan this whole page for ideas. Stretch your legs at one of the short trails along the way. Not only does Bow Summit offer one of the most famous views in the Rockies (Peyto Lake), but also a short interpretive trail that meanders through high elevation meadows.